Parents can travel lighter on their next trip to London with Jumeirah Hotels & Resorts’ new Family Fun accommodation package. Available from 17 November, the package includes a bespoke box of toys curated by the experts at London-based subscription service Toy Box Club. Families can choose from the luxurious Jumeirah Carlton Tower in Knightsbridge, boutique Jumeirah Lowndes Hotel in Belgravia or contemporary Grosvenor House Suites by Jumeirah Living in Mayfair. 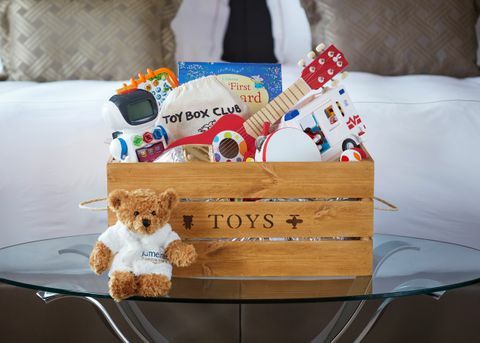 Along with the box of toys which is theirs to enjoy throughout their stay, children will also receive a selection of sweet surprises and find a complimentary Jumeirah bear waiting for them in their room. For families planning a festive season trip to the capital, the properties are adding some Christmas magic to the package. All three are located within a short walking distance of Hyde Park, home of the annual Winter Wonderland fair. Any family staying on the Family Fun package between 17 November and 31 December will receive a complimentary festive fun pack to keep, including Christmas hats, reindeer antlers and festive toys to get children Winter Wonderland-ready. Each hotel and residence has also added an extra element of luxury to their packages. Grosvenor House Suites by Jumeirah Living will offer a selection of complimentary classic Christmas films, guests at Jumeirah Carlton Tower will find children-sized slippers and bathrobes to borrow in their room, whilst at Jumeirah Lowndes Hotel kids will receive a fun-packed goody bag including colouring books and stickers. At bedtime, children will love the special turndown amenity of biscuits or cookies and milk.